Just imagine a bank with no customers, where pulp is fiction and data is green. Confused? Step forward, digital retail media! DDS Poland, a Scala Certified Partner, has created an innovative interactive multi-touchpoint digital media network for Alior Bank, Poland’s newest bank. 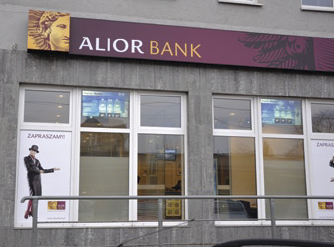 In the world of retail banking, Alior Bank S.A. is a young and ambitious newcomer. Conceived in 2007, the brand was formally launched across Poland in November 2008 and immediately made an impact via 80 financial service centers and eight business centers which were opened across 10 regions in 50 of Poland’s largest cities. The ambition of the business is to gain market share of 2-4 percent of the retail banking sector in Poland and win the confidence and business of one million customers. Alior plans to achieve this by opening 20 more facilities in 2009 and by providing a retail banking proposition that is credible, efficient and attractive to its prospective customers. Alior’s early challenges were significant. As a new retail banking brand it had to develop a customer base from scratch. This meant building a clear set of principles and brand values that customers could identify with and relate to. They had to be credible enough for customers to consider moving their own savings and investments from existing retail banks they may already have long-term relationships with. So while on one hand the brand needed to exemplify professionalism, credibility, efficiency and security, it also needed to find ways to differentiate itself from its competitors. It chose to do so by promoting additional core values of technical literacy, environmental friendliness and modernity. 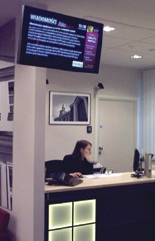 Alior recognized that its service centers acted as a communications channel in their own right. Prospective customers were as likely to visit a center to experience the brand, investigate products and services, and talk to staff as they were to engage traditional and new media at home and online. Alior also recognized that it needed to find a way to convey product and service information to customers but wanted to reduce its carbon footprint and support its green credentials by substantially decreasing its reliance on printed leaflets, brochures, statements and other paper-based products. Its target was a reduction in its consumption of paper-based products by 50 percent compared to traditional retail banking businesses. The diversity of its myriad goals led Alior to the conclusion that digital retail media would enable it to deliver on all of these requirements: its “eureka” moment. Alior subsequently engaged with DDS Poland, a leader in digital signage and retail media communications, to develop a wide range of cutting-edge digital products and services to enhance the customer experience, reinforce its core brand values and promote account growth. If digital was Alior’s medium of choice, presentation was key in engaging and informing customers before, during and after their visit. This was especially true for prospective clients; Alior had perhaps just one opportunity to impress the customer and promote a positive response to the bank and its objectives. A process of research and evaluation led Alior and DDS Poland to develop a multiple touchpoint approach using similar principles to contemporary car design. Here’s the scenario: using a touchscreen, a prospective car owner will touch and view a few key parts of the car when he/she assesses the suitability or quality of the car prior to making a purchase decision. He might, for example, view the door handle, steering wheel, driver’s console, driver’s seat and trunk release. If these particular areas of the vehicle meet or exceed build and quality standards expected by the customer, then the customer is more likely to accept that these qualities are reflected in the rest of the car. High-impact, brief messaging on products, services and brand-building content is displayed on the main streetfacing window of each service center reaching out into the busy street to capture the attention of passersby. This content is designed to quickly engage, build brand recall and elicit a positive response from the customer, either to visit the bank or go online to find out more about Alior and its offer. A powerful projection system broadcasts Alior Bank content onto a thin transparent film attached to the inside of the window delivering a high-impact/highcontrast message to the street without sacrificing natural light into the store for a brighter, more appealing store environment. As a customer enters Alior Bank, he or she is greeted with a network of large-format (40”+) plasma and LCD screens designed into the retail environment which help them plan what they would like to do, in what order, and where in the store they need to go to fulfill their requirements. Screens positioned in the foyer area display brief welcome messaging complete with branded items and key information to reaffirm the Alior brand. These screens also show localized news and weather content from selected Web/RSS feeds which are presented within an Alior-branded template designed within a Scala software environment. 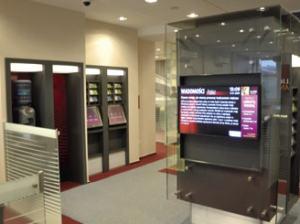 The bank is able to update content on these screens via branded templates created by DDS Poland using Scala to enable authorized staff to update key information in advance or in real time, depending upon the needs of the business and in reaction to the business of the store or availability of staff. Alior has deployed screens at service counters and as part of a queue management system to provide product and service information to customers waiting to see a consultant. Screens adjacent to the service counters display longerform content for longer average viewing periods during queuing, often anticipated at peak times. This content provides helpful new product, service and brand information to customers while they wait, offering incentives where appropriate. Screens at service counters provide something to watch, enabling Alior to promote its products and services to customers while they queue. Consequently, the length of time a customer thinks they have waited is often shorter than their actual waiting times. When a customer does reach a counter they are likely to feel more positive and better informed than they would be without the system. Further broadcast screens (one-way communication channels) are located in key areas throughout the store including consulting areas and other areas where queuing is likely. 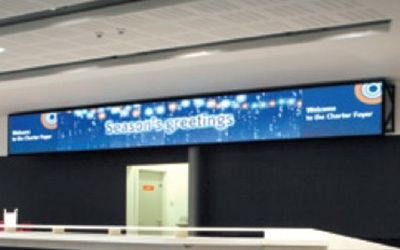 These screens are designed into wall space and, similar to the welcome screens, they provide store-wide coverage for key brand and product information. 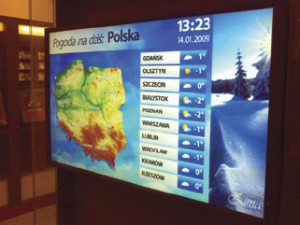 In order to improve the relevance of information customers could access, Alior and DDS Poland specified further interactive channels which, in combination with the broadcast screens, provided multiple access points for customers to review, retrieve, store and forward information they specifically requested. All of this functionality is centrally managed and linked to the broadcast and interactive screen network via a DDS Poland-supplied system powered by Scala. In addition to the broadcast screens, Alior and DDS Poland designed and implemented separate interactive 17” screens complete with touch-sensitive capability enabling customers to select, store and even e-mail key information to their personal accounts. Not only does this provide customers with instant access to information, it also considerably reduces the amount of paper and other collateral traditionally produced, which, in turn, reduces consumption, a key brand value of Alior Bank. One of the pillar brand values Alior sought to convey to customers was technical competence. By providing customer-facing technologies that are well-designed and reliable, there is little reason for customers to doubt that the systems behind the scenes are any less robust. Conversely, poorly designed or implemented systems would be likely to reduce customer confidence, which in Alior’s case would cause a barrier to customer development and retention. Taking this principle to heart, DDS Poland committed to providing a highly specified “best-in-class” platform to operate all of the channels in Alior, including broadcast and interactive screens, Bluetooth® connectivity and content management systems capable of enabling individual stores to update their own content within a carefully managed, branded, Scala-controlled environment. DDS Poland chose Scala to power the generation, scheduling and reporting of all Alior and third-party content across these multiple digital channels to ensure that the overall customer proposition was integrated, seamless and of a consistently high quality, values that were very much in line with Alior Bank’s customer promise. Not only did the Scala platform have to perform across these multiple channels, a further requirement was scalability. 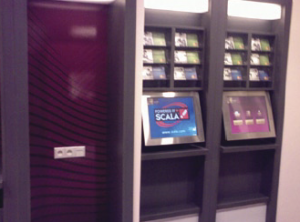 In order to ensure that the network design was able to move quickly in line with Alior’s ambition to install new sites in 2009/10, a prerequisite of DDS Poland’s choice in using Scala was its capability of scaling up to at least 1,000 sites in its current configuration without incurring redesign or realignment costs. Because Scala is scalable up to tens of thousands of screens, it gives Alior even more room to grow its network in the future. DDS Poland’s use of Scala meant that content could be created both at DDS Poland’s studios and, when required, at Alior Bank’s head office, then compiled, scheduled and readied for playout centrally via DDS Poland. This ensured that content playlists (start and end dates) were at all times correct and compliant with the bank’s promotional cycle. Once process-managed, content is seamlessly transferred to stores via ADSL using local providers. Alior has built the existing multichannel approach into their store concepts for 2009, and it is likely that customer research conducted in 2009 will indicate how the service is used by customers, identify which parts are of most value and clarify areas for further development in 2010. What is clear from an anecdotal perspective is that Alior and its customers like the digital approach as it underpins many of Aliors brand values. In this regard, digital signage and digital retail media are likely to be seen as integral to the retail offering, not just “bolted on,” as there are tangible benefits that come from deploying digital media. There simply wouldn’t be, for example, any other way to convey the same volume of product and service messaging without using digital media unless the bank reverted to paper, which it has pledged not to do. The adoption of digital as the core in-store communications medium also provides customers with a level of interaction and choice that Alior’s competitors do not currently offer. Not only does this provide additional value to the customer, it also provides a point of difference with competitors and will assist Alior in positioning itself to reach out to the 2-4 percent of the market it has set out to capture by the end of 2009. It is early on for the bank and for its digital retail media offering, but even at this stage, the signs are highly encouraging. DDS Poland Sp. z o.o. specializes in the implementation of digital signage systems using a highly qualified team of Scala engineers who deliver best-in-class service to a range of clients on some of the most advanced projects of their kind. They offer a complete turnkey solution from design and implementation to management and servicing. In order to further enhance their proposition, DDS has recently enhanced its design studio to increase its capacity and capability to produce custom content for digital signage networks. This full-service offering provides their clients with an optimal model for working in partnership and to realize mutual success. For more information, visit www.ddspoland.com.